On Saturday, May 4 at 8 p.m., Temple Beth Hillel will host the U.S. premiere of a live multi-media concert event. Tickets are now on sale for “La Nona Kanta: (translation: The Grandmother Sings) The Remarkable Life of Flory Jagoda”, celebrating the life and work of the award-winning, Bosnian-born Sephardic singer and composer who is known worldwide as the Keeper of the Flame of Sephardic and Ladino music. The event will be performed by Trio Sefardi, an ensemble of musicians who each played with Flory, now age 95, for many years. This event is presented by Temple Beth Hillel’s Congregation Beth Ahm Legacy Fund, in collaboration with the National Institute for Holocaust Documentation at the United States Holocaust Memorial Museum in Washington, D.C. In filmed interviews, Flory Jagoda shares her life’s experiences and tells how music helped her escape from Nazi-occupied Yugoslavia as a teenager. She recounts how she made a life in the U.S. and turned the tragic fate of her family and Balkan Sephardic culture into a celebration of five centuries of faith and tradition, giving meaning to the rest of her life, and delighting audiences worldwide. 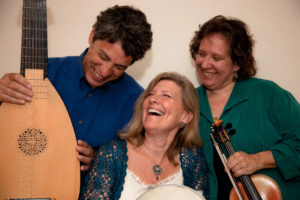 Her recorded narration alternates with live performances of her Ladino music by Trio Sefardi, and features photos from the Altarac Family archives and video from the film documentary “Flory’s Flame”. Tickets are $20 and include refreshments after the event. Tickets may be purchased in advance by calling Temple Beth Hillel’s office at 860-282-8466, or at the door.